At the end of every business meeting, the general idea of the main discussed topics and follow ups are written down in a summary format. It highlights all details such as the current status, the follow up meeting and numerous tasks to be accomplished. 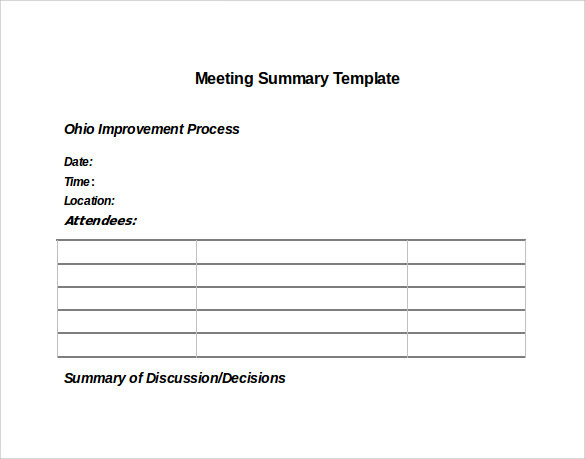 These Meeting Summary Templates are very valuable as most of the investors (before committing to an investment) read them to get an idea about the company and its operations. It is easily downloadable to save time and effort. 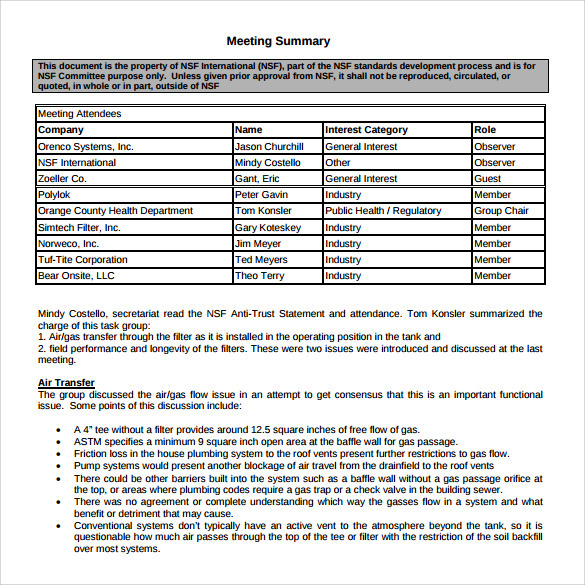 This template involves attendees representing various companies to discuss a common issue. Two or more subjects are introduced and discussed, which involves the operations within the company. Factory based problems and functional issues are addressed in the operative service level. Filter graphs are drawn to show quantitative demonstrations after a specific period time. Action items and group reviews are also created. The project title, date, time, location and present members are mentioned. 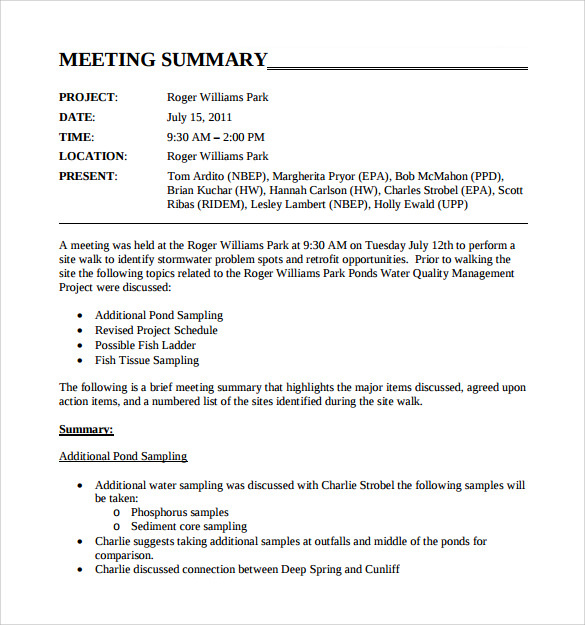 The meeting is held at desired location to study certain concerns such as storm-water issues and afterwards the members pay a visit to the actual site. For water quality management; some points are discussed like pond sampling, fish tissue sampling, fish ladder and altered project plan. 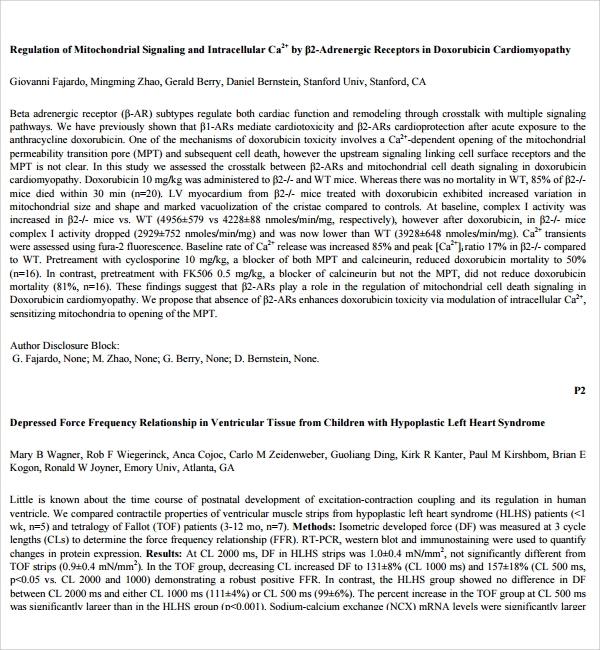 Heart failure in children and their varied reasons are discussed in the meeting highlights of the first conference. New scientific approaches and innovative novel therapies are presented. 3D echocardiography modern technology advancement are presented and discussed. Top most heart specialists and medical experts are present in such meetings and consider various latest strategies and technologies for combating heart failure issues in kids. This template is an agenda form presented on safety moment. 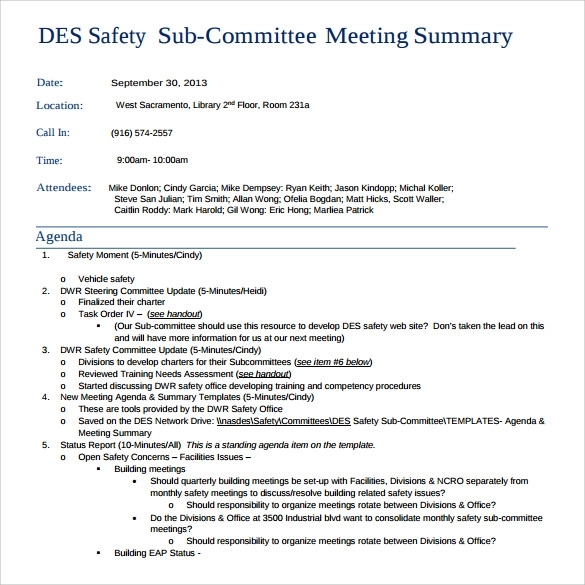 DES safety resources are discussed. Vehicle safety, office safety, building safety and other new safety concerns are presented. Charter committee approval is prepared for due approval. There are status report of ten minutes that considers open safety and new safety concerns. Companies presenting similar events for training purposes discuss their plan on a specific date. 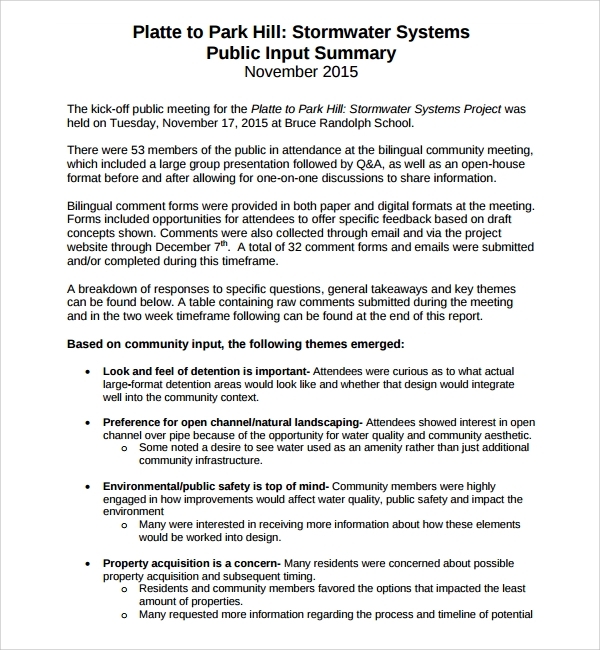 This is a template displaying public meeting event with sizeable attendees. IT council members, department of IT staff and several guests are present. Financial statement is presented and cyber security strategy is discussed in length. 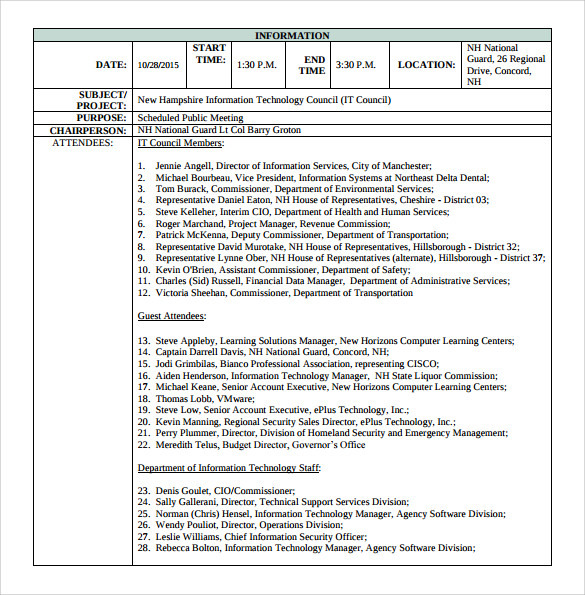 Future IT plans and governance are also considered. Membership updates and introductions are made in minutes. Time and venue for next meeting is set up. This template is a programme with parents as participants and expert consultants; for strengthening family ties in any State. It mentions doctors sharing their vast experience on family therapy sessions and early childhood problems. 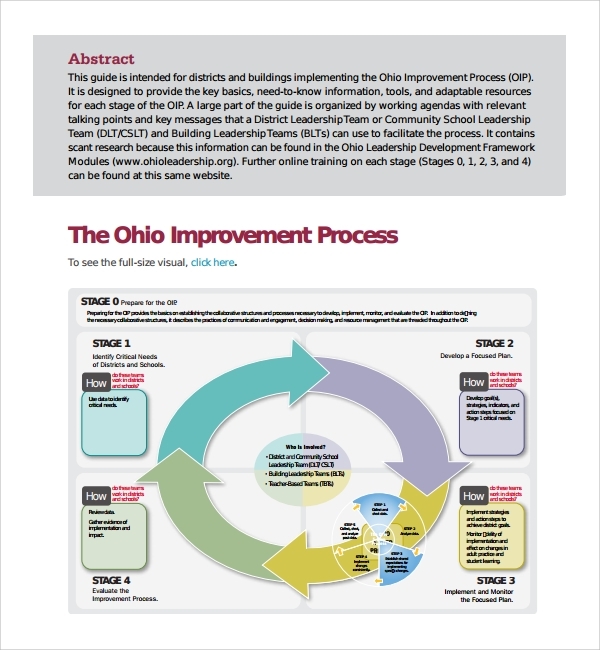 Efforts taken for strengthening families and protective factors can be discussed. 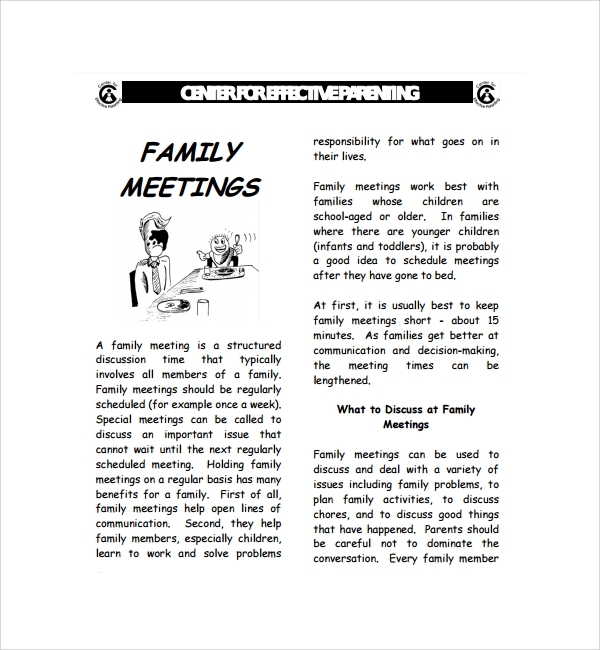 Parent cafe slides, power point presentations to take initiatives in training other parents. Sensitive topics like child abuse and neglected childhood are also put for study. 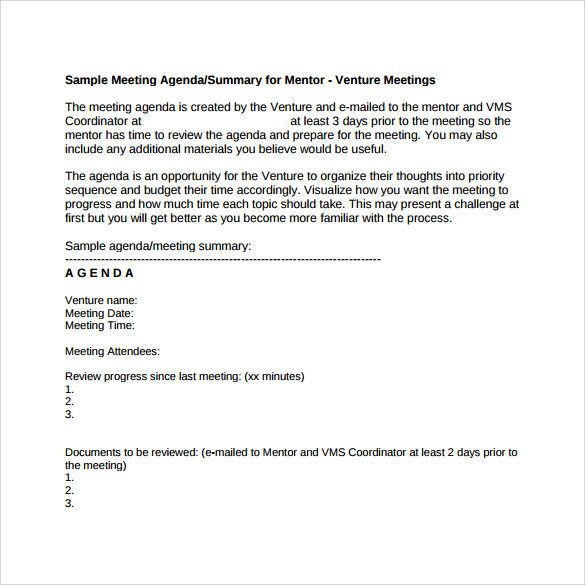 Template showcasing the agenda for a meeting developed by Venture and emailed in advance to the mentor, in order to review the contents and make additions. This simple template is easily downloadable. One just has to fill out important points mentioned such as date, time and venue of the meeting. The list of attendees and the summary of the discussions were to be mentioned. Any important decision that was taken during the meeting was also to be mentioned.